It is no secret that music has a powerful effect on us both physically and psychologically. A particular piece of music can evoke fond memories, elevate our mood, and even help energize us during a workout. 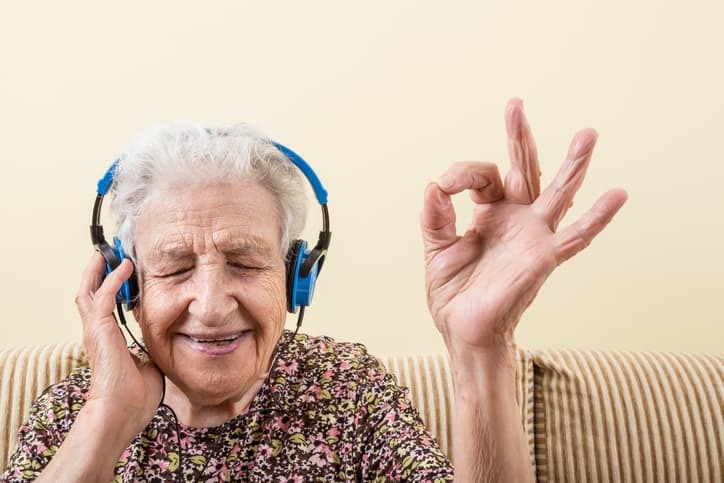 According to the American Parkinson Disease Association, music can even help seniors combat some of the effects of Parkinson’s disease. There is some evidence suggesting that music can stimulate the body to produce more serotonin and dopamine. It is the lack of these two neurotransmitters that lead to the development of Parkinson’s. Parkinson’s patients typically have trouble initiating movement, experience slowed movement and “freezing,” and may have difficulty maintaining continuous movement. Listening to a piece of music can provide the necessary motivation and stimulate the impulse to move. The rhythm of the music creates a greater awareness of the body and can provide a template to help guide movements. As Parkinson’s affects the various muscles needed for speech, patients often experience slurred speech and a decrease in the volume of their voice. Singing exercises the diaphragm, which can improve breath support and increase voice volume. Creating a rhythm, such as tapping the hand while speaking, can also help coordinate tongue and mouth movements for clearer speech. Music with slow rhythms can promote relaxation, which can help calm involuntary movements and tremors. Put on your loved one’s favorite genre of music and have a sing-a-long. The key is to find a type of music that you both enjoy and to keep the mood light and relaxed. For example, you can start singing as you help your loved one get dressed in the morning or as you prepare a meal and ask your loved one to join you. As a general rule, you should try to match the rhythm of the music to the mood that you are trying to create. If your loved one used to play an instrument, encourage them to play as often as possible. If neither of you is musically inclined, simply clap along to your favorite songs. Create a playlist of popular dance songs from when your loved one was in their 20s or 30s and ask them to teach you some of their favorite moves. No two people with Parkinson’s experience the disease in quite the same way. At Alamo Companion Services, our caregivers are certified in Parkinson’s care so that they can provide personalized care based on your loved one’s unique needs. Contact us today for more information.